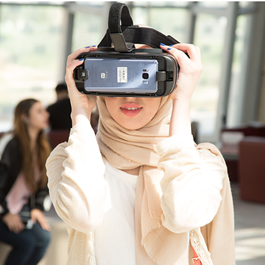 The Media Arts and Game Design module will enable you to take the initial step for a career in emerging technologies. This module will help you to learn the foundations of digital interactive art, gaming, creativity for web, sensor based interactions, and useful daily applications of digital media. You will graduate with a portfolio that may lead you to a graduate program in interactive arts and gaming. You will develop skills for collaboration with digital media specialists. Media Arts and Game Design module will introduce you to emerging trends in interactive arts and will give you several opportunities to create various interactive objects and platforms for a variety of uses. Special attention will be given to the development of form and content. We will also emphasize the ability to create a wide scope of decision making opportunities for the users (players, consumers) of these projects. As a capstone, you will expand a final project that you developed in one of the module classes or build a new project that becomes a portfolio piece. Develop an understanding of interactivity and exhibit that understanding via the creation and analysis of a range of interactive works.